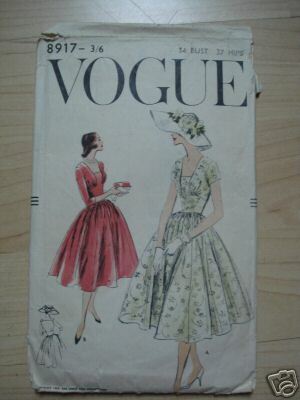 Anyway, even though I didn't buy any fabric, I did manage to buy the pattern above, from eBay seller nateesh. Isn't it pretty? Square necklines with underbust gathers will get me every time. I'm hoping to announce two fun Dress-A-Day-related projects this week. They're exciting! And geeky! Look out! Welcome back!hat is one purty dress pattern…. Waiting with bated breath for the DaD announcements. A “secret lives” book? When I went to Las Vegas the first time, got off the plane and saw the one armed bandits in the departure area between me and my baggage, I definitely knew I was “not in Kansas” – when I saw the “signs” on top of the taxis that was number two..and then being approached on the street by the guys giving out little slips of paper with addresses and phone numbers. The funniest part was that this was during the “Circus Circus” period when Las Vegas was trying to bill itself as a “family resort”. When you have to wear a uniform that makes even the most lovely of women look like someones large matronly grandmother you start to notice how great all of the people flying look. As a TSA employee one of my favorite things to do is fashion watch. Some people wear the most incredible clothing when they travel!! I especially love travelers from out of the region, they always have something new and innovative that just has not hit locally. Thanks for the new word: “ell.” Even though we do not have the same taste in clothing, I love your blog for the language. Thanks for keeping that bar held high! Yay, I’ve been missing the posts. Also my comments haven’t been showing up, I don’t know what I’m doing. I’m excited about the project, is it for you or for us? I’ve internally and secretly responded to a few of your unofficial assignments. I LOVE exciting and geegy! Yeah, I just flew out of Vegas a week ago, they were really useless at security–lines were incomprehensible (and we were told ot go places that didn’t work), bins were non-existent, no one seemed to know how to work the machines….you know I travel a lot, and that was the worst I’ve seen in a LONG time. In-N-Out is tasty but the experience of ordering and waiting to get the food is on par with the second level of hell. No exaggeration whatsoever. In-N-Out Burger is the best! My first stop when visiting CA,NV or AZ. In the future we’ll probably have to get permission to fly unless the airlines have more clout than TSA/Homeland Security. Exciting and geeky!!! Bring them on! Eh. Tommy’s in LA is better than In-N-Out Burger, in my humble opinion. Love the pattern! Oh, I want that pattern! !